Dakar trottoirs est le récit d’un amour brûlant entre Salla et Siirou dans cet univers microcosmique des « trottoirs » de Dakar. S’y confondent les personnages surréalistes d’un théâtre paradoxal au coeur de la ville. Derrière les façades des quartiers huppés qui côtoient les taudis, le « deal » y est la règle, la grâce côtoie la misère, la sensualité est omniprésente, la violence aussi. Ici tous les rêves sont permis, mais parfois ils tournent au cauchemar. Dakar trottoirs (Sidewalks of Dakar) is the story of a burning passion between Salla and Siirou in this microcosmic world of the « sidewalks » of Dakar. Here the surrealist characters of a paradoxical theatre intermingle in the heart of the city. Behind the facades of the posh districts which stand alongside slums, the « deal » is the rule; grace and misery go hand in hand; sensuality is omnipresent and violence too. Here all dreams are possible but sometimes they become nightmares. « Dakar is a peninsula which was built from the coast and in particular the Plateau district which is the main administrative and commercial area of the city. Here, the older buildings stand alongside the former colonial constructions. Many of these colonial constructions have been renovated into modern buildings. Dakar Plateau is one of the protagonists of the film. It is a city with two faces: during the day it is marked by a hive of activity; thousands of Dakar inhabitants invade the city in the morning as they go about their business and then leave it in the evening in tight ranks as if they were afraid of the nightfall. It is at this point that we are gradually able to discover the other face of Dakar: the nocturnal fauna which are finally able to spread their wings. Dakar: shadow and light. Even if it is fictional, I initially started working on the project as a documentary and I immersed myself in this universe, living as close as possible with this nocturnal « fauna ». Then, moving away from the notion of a documentary and dealing with the fictional side seemed to be the main challenge of the film: how to go about telling a love story in this context as it was quite obvious that it could not be experienced in the same manner as if it had occurred in a structured social environment. 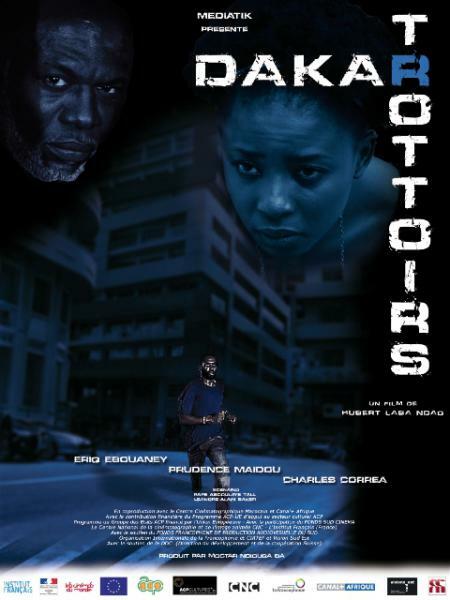 Sortie film : "Dakar Trottoirs", film d'Hubert Laba Ndao.